With Mother’s Day approaching, families nationwide are looking for ways to celebrate moms. A new paper by the Ewing Marion Kauffman Foundation out today urges policymakers, employers and entrepreneur support organizations to honor moms in the workforce and starting businesses by adapting policies that reduce the “double whammy” of challenges these moms face. 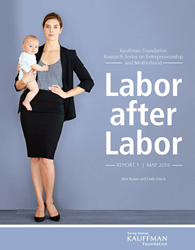 'Labor after Labor' is the first in a new Kauffman Foundation series of reports on entrepreneurship and motherhood. Read the full report, including a list of policy recommendations, here.